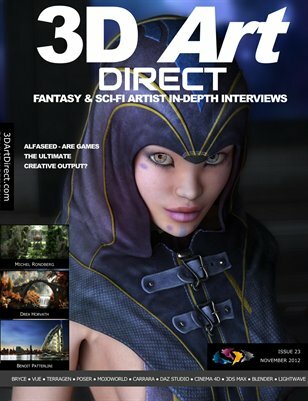 3D digital arts magazine with in-depth interviews in the fantasy and sci-fi genres. Editorial: 3.75 Degrees of Separation Interview : AlfA SeeD “We see games as the ultimate creative output: they have story, involvement, role playing, beautiful arts and amazing music. “ Interview : Benoit Patterlini “I try to explore several universes for each single piece of my work. I ever try to evolve and develop my own style.” Interview : Drea Horvath & Michel Rondberg "As long as you love what you do and you put this love and effort into your artwork, creativity won't leave you." "A lot of artists find a 'formula' if such thing even exist and stick to it, this is the same moment it becomes uninteresting. Keep reinventing yourself."